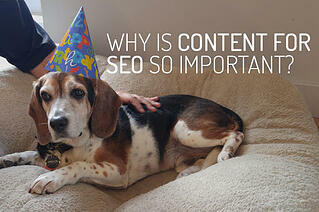 Why is Content for SEO So Important? SEO, or it’s more formal name “search engine optimization,” is the practice of creating optimal visibility for your website online when people are searching for it. There are a couple hundred or more ranking factors that help Google (and other search engines) decide to present its results when a keyword or key phrase is entered into the search engine. Here at Page One, one of the most important ranking factors that we help our clients with is their on-page meta data. This includes title tags, header tags, alt image text, meta descriptions, and optimization of the copy on each page. Basically, what we do is we research the best keyword to target for each page of their site and then ensure that keyword is found naturally in the page title and the content of the page. This is where, primarily, the content is so important for SEO, because it helps to support and reinforce your website’s target keywords. When a bot or spider crawls a page, it begins to learn what the page is about by the meta tags and the body copy. Without copy on the page, Google can’t be too sure what the page is actually about. Here’s an example that helps to illustrate this point. Donald has a website that helps dog owners throw birthday parties for their dogs. Donald is a dog photographer, so he has a ton of awesome photos on his website. However, Daisy also has a website to help people throw dog birthday parties. Not only does her site have a few great photos, but the web pages offer tons of great tips and ideas for throwing the best birthday parties for dogs. Daisy’s website will most likely show up on the search engine results page (SERPs) higher than Donald’s website due to the variety of content that is on the site’s pages. You know those “over 200 ranking factors” we mentioned earlier in this post? Well, sitting right there next to content as a top ranking factor are links. Links help to create the worldwide “web” as we know it, but they also help Google rank web pages. Think of a link as a “vote” and then go back to my example about Donald and Daisy’s birthday parties for dogs websites. The more interesting, unique, and helpful content you have on your website, the more likely it is someone will link to it from their own site and/or share the link on social media. Google takes notice. Of course, Donald’s site may have a really awesome backlink profile (the fancy name for “links back to Donald’s website from other websites”) because of all of his great photos. But, because of all the blogging that Daisy does, on a variety of different topics, she’s sure to have a handful of great websites linking back to hers. Helpful, useful, unique content supports link building which is part of an overall, holistic SEO strategy. So, next time you’re tasking with writing a blog or news piece for your website, know that it’s going to serve multiple purposes, including helping to drive new and qualified traffic to your website. Special Shout Out: Happy 13th Birthday to Argos Huffington Specklebelly, one of the best office dogs I have the pleasure to work with and my muse for this blog post.